50 mobile and Facebook game usability studies done since 2010 for Glu Mobile, Zynga, DeNA, TinyCo, Atari, TinyCo, Konami, Bandai Namco and various startups. Usability can be done early, before launch. Actually watching closely as a person plays your game, as they “talk through” the process of playing, and then discussing it with them - reveals many nuances of usability that aren’t apparent via metrics. You get at “why” consumers feel or do what they do. If a person doesn’t click on the store icon, why is that - did they not see it, did it look like something else, what should be changed to make it clear it’s the store icon (is it a small adjustment, or an entire re-do)? Only usability can answer those types of questions. One on one usability studies can reveal “sticking points” which may cause 50 to 75% of consumers to quit playing, slashing your revenue. 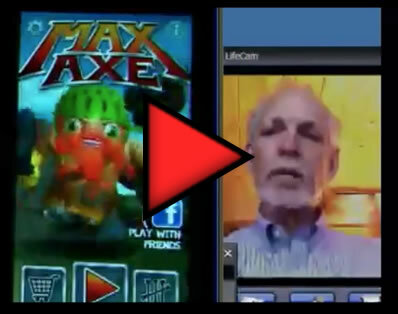 Sessions are streamed live, including video of the iPhone game being played with the consumer’s fingers shown as they tap - and a face cam of the consumer to show their facial expressions. We communicate with you, the client, live via Chat during the sessions. The Process: I play the game to prepare, and take full notes during the session in Excel. Generally only 10-12 individual sessions are needed.